I’m tired of people who are busy losing this world war because they are still obsessed with the previous one, which ended generations ago. Anti-Nazism has mutated into a permanent witch-hunt on an imaginary enemy. The notion that “neo-Nazis” constitute a prominent group today is nonsense. The most dangerous people by far are those running the European Union, who are busy dismantling European civilization and enlarging the borders of the EU to include the Middle East and North Africa, thus flooding their own countries with tens of millions of Muslims and other hostile aliens without consulting the native population. This makes the EU the largest criminal entity on the planet, preoccupied with destroying an entire continent, dismantling the greatest civilization that has ever existed and replacing the native population with others. I have described this in my book Defeating Eurabia, which is available online. The French philosopher Alain Finkielkraut thinks that “Europe does not love itself.” He says that it's not forces from outside that are threatening Europe as much as the voluntary renunciation of European identity, its wish of freeing itself from its own history and traditions, only replaced by human rights. The EU isn’t just post-national; it’s post-European. Next to the EU, the most dangerous people are the Leftists all over the Western world who are waging a Jihad to destroy their own civilization and have teamed up with Muslims to achieve this goal. Unlike neo-Nazis, these people are not only far more numerous but socially accepted and disproportionately represented in the media and the education system, where they systematically silence “racist” dissenters by destroying their livelihoods and reputations. They use an imaginary “far-Right” threat to crush people they don’t like. In the United States, the host D.L. Hughley at TV channel CNN stated that the Republican Party looked like “Nazi Germany” because a majority of their members are white. Being a “Nazi” today means “being born white and standing up for yourself,” nothing more and nothing less. In fact, you don’t even need to stand up for yourself; merely being white and still breathing is sufficient for some. Hübinette is an “anti-Nazi.” Since his agenda is apparently the genocide of all whites, one must assume that a “Nazi” is thus any white person who opposes his own eradication. He has continued promoting “Multiculturalism,” even received awards. To some, “Multiculturalism” apparently means “death to white people and their culture,” pure and simple. The escalating wave of physical violence targeting whites in Western streets is closely tied to a rise in verbal abuse directed against whites from Western media. Even the “conservative” Swedish Prime Minister Reinfeldt has stated that the traditional culture of his country was “barbarism” and that everything good was imported from abroad. If he had said something similar about any other ethnic group on the planet he would have been forced to apologize, but saying disparaging things about Europeans and their culture is actively encouraged. Talking about “Islamophobia” while leaders and organizations across the world are bending over backwards to appease Muslims is a joke. The truth is that, perhaps next to Jews, people of European origins are currently the most demonized people on the planet, systematically denied even the most basic level of dignity and self-preservation. Yet while anti-Semitism is at least mentioned in the media as a problem, anti-Whiteism is simply taken for granted. Ironically, both self-professed “anti-Nazis” as well as the marginal neo-Nazi groups that do exist seem to labor under the delusion that the Nazis were “pro-white.” They were not. While Jews and Gypsies topped their hate list, they didn't particularly like “Slavs” such as Poles or Russians, either, even though they were white and in many cases a lot blonder than Mr. Hitler. Most of the people who died in Europe during the Second World War were non-Jewish whites, even though the percentage of the Jewish population that was eliminated was certainly extremely high. The Nazis waged a brutal war against other Europeans but had a positive relationship with Arab Muslims. Frankly, I would be tempted to say that Nazism was a form of Jihad against European civilization, and unfortunately a rather successful one at that. There is no single human being who has ever done more to destroy the white race than Adolf Hitler. The idea that Jew hatred was “imported” to the Islamic world from Nazi Germany is total nonsense, as proven by Dr. Andrew G. Bostom in The Legacy of Islamic Antisemitism. He is also the author of the excellent book The Legacy of Jihad. Despotism, too, comes natural to Islamic culture and does not need to be “imported.” In fact, on some levels Islamic culture is arguably more totalitarian than the most totalitarian of Western ideologies. Even the Communists and the Nazis, who championed some of the most evil ideologies ever seen in European history, didn’t ban all forms of pictorial art, ballet and classical music as a matter of principle. Fascist leader Mussolini did not deliberately destroy the artworks of Michelangelo or Raphael, but Islamic Jihadists will, if given the chance to do so. It is only a matter of time. Nevertheless, Nazism certainly had much more in common with Islam than it had with Christianity, and the admiration was and remains mutual. In 2005, Hitler’s autobiography Mein Kampf was among the top bestsellers in Turkey, behind a book about a Turkish national hero detonating a nuclear bomb in Washington D.C. At the same time, Turkish Prime Minister Erdogan stressed that Islamophobia must be treated as “a crime against humanity.” It is banned by law to discuss the Armenian genocide in Turkey. Would a country the size of Germany, with a history of a thousand years of continuous warfare against its neighbors and where Adolf Hitler is a bestselling author, be hailed as a moderate, Christian country? It is quite clear from the actions of many Turkish and other Muslim communities in Western countries that they are here to colonize, not to adjust to their adopted homelands. Some of them have serious plans to blow up their fellow citizens in Jihadist attacks. In 2008 an elderly Cologne Council member, Hans-Martin Breninek, was beaten unconscious and sent to hospital by young Turks. He was handing out information warning against the Islamization of his country and his continent. Just how many native Europeans who have been beaten up, mugged, raped or killed by gangs of Muslims immigrants, in Germany and elsewhere, is impossible to say, but the number keeps rising fast. It’s time we say that enough is enough. I am aware of the fact that there are anti-German feelings still prevalent in some quarters, but I do not share these feelings. My country was once occupied by Nazi Germany, but I see no rational reason to blame young Germans for this. I realize that the situation today is radically different from what it was back then, and I derive no pleasure from seeing Germans being humiliated at home by members of backward tribes. The entire European continent is now under siege. The groups who insult and harass the inhabitants of Berlin and Hamburg do the same in Oslo, Copenhagen, Amsterdam, Brussels, Paris, London, Rome and Athens. Germans are not “Nazis” or “extremists” if they say that they do not want more Muslim immigration, period; they are merely exercising their right to retain their own land and shape their destiny as a people. Germans do have that right, just as much as Thais, Indians, Kenyans, Frenchmen and Italians do. Those who say otherwise are evil and should be denounced as such. Europe is not complete without German culture. There is nothing that can be done about the past so we need to concentrate on the future. There is no reason to single out the Germans as the bad guys this time around. They now have a golden opportunity to redeem themselves and play a positive role as defenders of European civilization, something which their population size and historical achievements entitle them to. 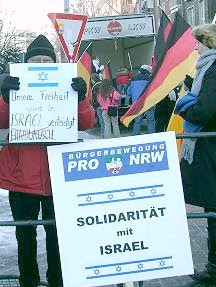 If anything, precisely because of her history, Germany has an even greater responsibility than others to stop the spread of Jew hatred that follows inevitably from Muslim immigration. The defenders of Multiculturalism are directly responsible for the current spread of Nazi-like ideologies in the Western world and are shameless hypocrites for claiming otherwise. Opposition to Islamization in Germany is good not just for Germany, but for Europe. For this reason, we should support the Anti-Islamization Congress in Cologne on May 9th.